BT Midland is a service-focused company working at the frontline to provide efficient internal materials handling and door solutions to customers in a wide variety of industries. BT Midland is a Joint Venture established in Thailand in 1997 between BT Industries, Sweden and Midland Corporation. Midland Corporation was the Distributor for BT Equipment from the early eighties. The BT and Raymond brand of materials handling equipment and Crawford door and docking range is distributed and serviced throughout Thailand. BT Industries was founded in 1946 in Sweden and two years later it produced the first hydraulic version of a hand pallet truck. 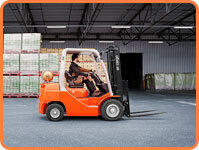 Later, in 1962, the first reach truck was put on the market and a rapid expansion followed. During the last decade BT industries has expanded trough acquisitions of Prime Mover and Raymond Corporation, two major manufacturers of electricwarehouse trucks from U.S.A. Since June 2000 the BT Industries Group has been part of Toyota Industries Corporation of Nagoya, Japan and together forms the world largest material handling company.